Assigning a player to the Engine Camera viewport. Pausing, speeding up and slowing down rendering, physics or game logic. Pressing f slows down the game logic, so player's rotation slows down too. Pressing g speeds up the game logic and, therefore, player's rotation. // set necessary parameters: FOV, ZNear, ZFar, view direction vector and position. For usage example of game intersections, see the article on the GameIntersection class. Returns a pointer to the Game instance. Sets user data associated with the game logic. Returns user data associated with the game logic. Pauses or resumes the game logic. Returns a value indicating if the game is paused or not. Sets the game frame with the given number as the current one. Returns the number of the current game frame. Sets the maximum rendering frame duration (time spent between the previous update and the current one). Returns the maximum rendering frame duration (time spent between the previous update and the current one). Sets the scaled inverse FPS value (the time in seconds it took to complete the last frame). Returns the scaled inverse FPS value (the time in seconds it took to complete the last frame). Performs intersection to find if a pathfinding Obstacle is located within the cylinder between two points. Returns a noise value calculated using a Perlin noise function. Returns a 2D noise value calculated using a Perlin noise function. Returns a 3D noise value calculated using a Perlin noise function. Assigns a new player to the Engine Camera viewport. Returns the current player assigned to the Engine Camera viewport. Returns a pseudo-random unsigned integer number. Returns a pseudo-random double number within a given range. Returns a pseudo-random float number within a given range. Returns a pseudo-random integer number within a given range. Sets a value that is used to scale frame duration. Returns a value used to scale the frame duration. Sets the seed for pseudo-random number generator. Returns the seed for pseudo-random number generator. Sets the time value for the game. Returns the current time spent in the game. const char * data - User data. Data can contain an XML formatted string. User data. Data can contain an XML formatted string. int enabled - 1 to resume the game logic, 0 to pause it. 1 if the game logic is not paused; otherwise, 0.
int frame - Frame number. Sets the maximum rendering frame duration (time spent between the previous update and the current one). It restricts the frame rendering rate to a fixed one. There is no difference if the real rendering FPS is lower than the fixed frame FPS. But if the real rendering FPS is higher than the fixed frame FPS, the engine will wait until the fixed frame time is over. To remove fixed frame duration, use -1.
float ftime - Frame time in seconds. -1 removes the FPS limitation. Returns the maximum rendering frame duration (time spent between the previous update and the current one). This function takes time scaling into account. -1 means no fixed frame duration is set. Sets the scaled inverse FPS value (the time in seconds it took to complete the last frame). This function sets a fixed FPS that does not depend on the real FPS the hardware is capable of. That is, it forces constant frame time increments between rendered frames, used for animation/expression update etc. To remove the FPS limitation, use -1. The function is useful when grabbing the video reel with a fixed FPS value (for example, 25 frames per second). When this mode is activated, engine.game.getFTime() will return a fixed frame time value set with this function. float ifps - Inverse FPS value (1/FPS) in seconds.-1 removes the FPS limitation. Returns the scaled inverse FPS value (the time in seconds it took to complete the last frame). This value does not depend on the real FPS the hardware is capable of. -1 means no Inverse FPS value is set. Scaled inverse FPS value (1/FPS) in seconds. If the game is paused, 0 is returned. Performs intersection to find if a pathfinding Obstacle is located within the cylinder between two points. The specified obstacles will be ignored. World space coordinates are used for this function. const Math::Vec3 & p0 - Start point. const Math::Vec3 & p1 - End point. float radius - Radius of the intersection cylinder. int mask - Obstacle intersection mask. The obstacle is ignored if its mask does not match. const Vector< Ptr<Node> > & exclude - Array with excluded obstacles. These obstacle nodes are ignored when performing intersection. Math::Vec3 * intersection - Intersection point. Define and initialize two points (p0 and p1) by using the Player::getDirectionFromScreen(). Create an instance of the GameIntersection class to get the intersection point coordinates. Check, if there is an intersection with an obstacle. 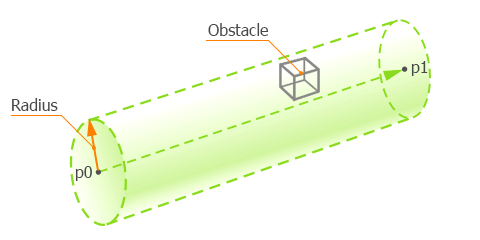 The Game::getIntersection() function returns an intersected obstacle when the obstacle appears in the area of the cylinder. After that GameIntersection instance gets the point of the nearest intersection point and you can get it by using the getPoint() function. const Ptr<GameIntersection> & intersection - GameIntersection class instance to put the result into. float pos - Float position. float size - Size of the noise. int frequency - Noise frequency. const Math::vec2 & pos - vec2 point position. const Math::vec2 & size - vec2 size of the noise. const Math::vec3 & pos - vec3 point position. const Math::vec3 & size - vec3 size of the noise. const Ptr<Player> & player - Player to set as a current one. double from - The initial point of the range. float from - The initial point of the range. int from - The initial point of the range. int to - The end point of the range. Sets a value that is used to scale frame duration. It scales up or down the speed of rendering, physics and game logic. This function can be used to create effects of slow/accelerated motion. For example, if the scale equals 2, the rate of simulation of all effects (such as particles) speeds up to two times faster. As for physics, in reality it will be simulated with the same fixed physics FPS, but the number of iterations will be two times higher. It is possible to scale the physics FPS separately via engine.physics.setScale() function. This function scales values set by both the setIFps() and setFTime(). float scale - Scaling factor. The provided values is clamped within the range [0;32]. Value to scale the frame duration. int seed - Number used to initialize a pseudo-random sequence of numbers. Number used to initialize a pseudo-random sequence of numbers. Sets the time value for the game. The time is counted off starting from the world loading and does not take game pauses into account. float time - Time in seconds. Returns the current time spent in the game. It is counted off starting from the world loading and does not take game pauses into account.